Hot bacon salad dressing is especially popular in the South over dishes with names like wilted lettuce and wilted green beans. The dressing lends a smoky, sweet-and-salty flavor to any dish and is perfect when used to dress a spinach, hard-cooked egg, onion and mushroom salad. This salad dressing should be served warm. Variations include using balsamic or red-wine vinegar instead of white vinegar and extra-virgin olive oil in place of vegetable or canola oil, red onion in place of yellow onion and brown sugar in place of white sugar. And if you like heat, a pinch of cayenne pepper never hurt anything. In a medium skillet set over medium heat, fry bacon until crisp. Remove bacon from pan, drain on paper towels and reserve, leaving the fat in the skillet. Add chopped onion to bacon fat in the skillet and cook several minutes until onion is translucent and soft. Remove onion from pan, drain on paper towels and reserve, leaving the fat in the skillet. Pour bacon fat from the skillet into a heatproof measuring cup. Add enough neutral oil to equal 1/2 cup. In a small bowl, whisk together cornstarch with 2 teaspoons cold water until blended. Transfer to measuring cup with bacon fat and oil and whisk together. Set aside. In the same skillet the bacon was fried in, whisk together vinegar, 1/2 cup water, sugar, salt and pepper to taste and bring to a boil. Add cornstarch-fat mixture, reduce heat to low and cook until thickened, stirring constantly with a wooden spoon, about 1 to 2 minutes. Add reserved bacon and onion and warm throughout. Remove from heat and serve while warm either drizzled over a salad, lettuce or vegetables. 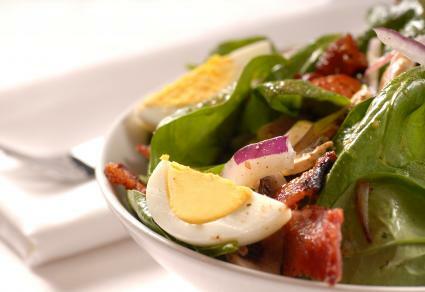 This classic salad recipe starts with baby spinach and is rounded out by hard-cooked eggs and red onion. Mushrooms are an optional addition. It's a luncheon meal in itself but, adding diced cooked shrimp, chicken, pork, turkey or beef makes it a filling dinner offering. Place spinach in a salad bowl. Add onion and mushrooms, if using, and toss lightly. Add hot dressing and toss again lightly but thoroughly so all the ingredients are covered. Divide among 6 salad plates. Garnish with 4 hard-cooked egg quarters per plate and 1 half-strip cooked bacon. Serve immediately. Don't count hot bacon dressing out when it comes to foods other than spinach, lettuce, and green beans. It can be used to dress hot German potato salad, smothered cabbage, and freshly boiled dumplings, too.